Let me guess, your first question is what is speculoos? It’s a Dutch shortbread biscuit, with similar seasonings to gingerbread. Then, some mad genius somewhere created speculoos cookie butter, a smooth, spreadable paste, with a texture similar to peanut butter. 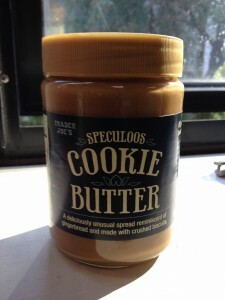 Thanks to Trader Joe’s, Americans now have access to speculoos cookie butter. It’s brilliant. I want to spread it on toast, on pancakes, or blend it in to a milkshake. Most of all, I want to eat it by the spoonful, straight out of the jar. I saw this post on Butter me up, Brooklyn and I couldn’t resist trying it out. 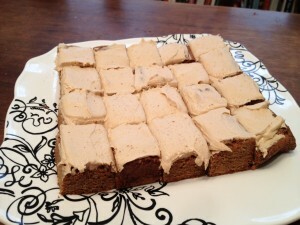 The recipe is easy and I thought it was addictively good – I found myself reaching for a fourth bar, before 10am. My only complaint is that the frosting is tooth-achingly sweet. Maybe there needs to be some dark chocolate incorporated in for balance, or at least a sprinkle of sea salt on top?